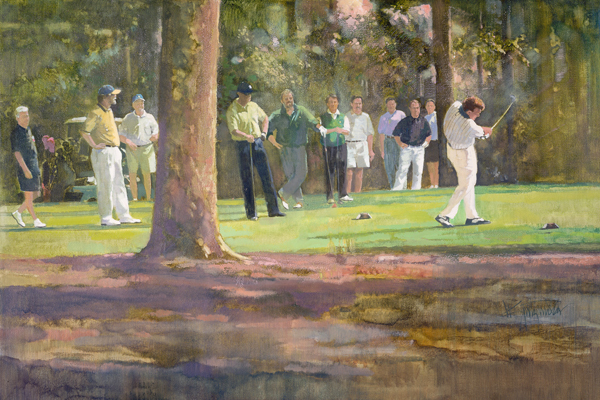 About Pinehurst Gathering: A group of corporate executives having an special outing at the venerable Pinehurst course. Perhaps they also got to enjoy the fine food and ammenities of The Carolina Hotel? About Pinehurst (from their website): The majestic pines towering over historic Pinehurst rustle and softly whisper the legends of golfers like Jack Nicklaus, Payne Stewart and those who have gone before and experienced one of America’s greatest golf courses and premier resorts. As Bobby Jones said, "There’s something about Pinehurst that tops even the position which it naturally occupies as the St. Andrews of American golf. And that is the people you find there, play golf with, and exchange reminiscences with…who always make you feel happily at home."